Press Packs and Media Information. We are currently running a fantastic offer aimed at Parent Teachers Associations across the UK to raise up to £1,000 for your school. With no cost to the school whatsoever. It's quick, simple, easy to implement and most important of all, free. We do all the hard work and supply your school with all the marketing matierials needed. 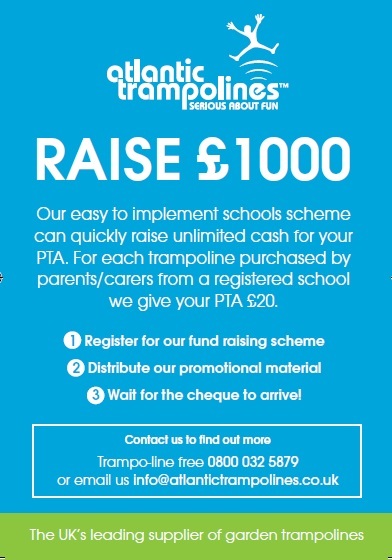 For every registered school we will pay £20 for any trampoline 6ft or larger as long as the parent or carer quotes the name at the point of ordering. It's that easy. Andrew Jardine, the founder of Atlantic Trampolines, is giving a talk next week on marketing and how we started bouncing back in 2005 at a Chartered Institute or Marketing event at the University of Aberystwyth. The Western Mail did a full page feature on the company and our approach to building the business. You can read the feature and the interview with Andrew by clicking 'Put the bounce back into your business'. Wednesday February 9th 2011 sees Atlantic Trampolines founder Andrew Jardine give a talk at Aberystwyth University on how to 'put the bounce back into your business'. Details of the event and how you can attend can be found on the Chartered Institute of Marketing website. 2010 Wales Marketing Award Winners! We are delighted to announce we have won one of The Chartered Institute of Marketing Canmol: Wales Marketing Awards 2010! The Awards are a celebration of excellence in ideas and execution and we are delighted to have been been chosen as winners.